20 Feet From Stardom is one of my favorite movies from recent years. This 2013 Academy Award winner (Best Documentary) goes behind the scenes with some notable background singers including Darlene Love, Merry Clayton, Lisa Fischer, Judith Hill, and more. These women sang backup on some iconic songs, but their names and faces are not well-known. You'll meet them in this movie, and also hear from singers including Mick Jagger, Stevie Wonder, Bruce Springsteen, Sting, Bette Midler, and more. The movie has some fascinating footage of 1950's background singers, who were often called "readers" because they had a great skill at reading music and hitting the notes pitch perfect. As the 1960's brought rock, pop, and soul music, background singing changed to a free form art, with more interpretation by the singers. The heart of the movie is Darlene Love, who found success as a backup singer working with Phil Spector. Her experiences working with him, and the trajectory of her career (both highs and lows) are chronicled here. Spector manipulated her, using her voice on songs by the girl group The Crystals (a group she did not belong to), while promising her that the songs she recorded would be promoted under her name. She did have a 1960's hit with "Christmas (Baby Please Come Home)." You will also meet Merry Clayton, who had a last minute, late night call to do backups for the Rolling Stones. She left the house in her nightgown and a mink coat to record the memorable background vocals on "Gimme Shelter." Some of the women profiled in this movie tried a solo career and returned to background singing. Some of them love background singing and harmonizing. They are all passionate about music, with great stories and songs. If you love music, especially 1960's and 1970's, you will find this movie fascinating. It is the rare film that I finished with the immediate thought: "I am looking forward to seeing this again." 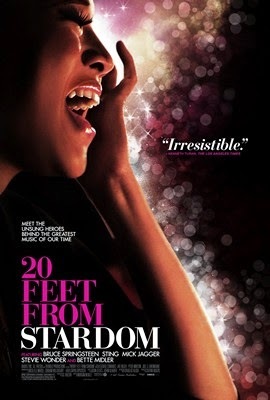 If you've seen 20 Feet from Stardom, I would love to hear what you thought of it in the comments below. Stopping by from the UBC. I can't wait to see this. Thanks for sharing the trailer. This is going on my 'must-watch' list. Thanks for sharing! Visiting from the UBC Thread. Good luck with the Challenge. Thanks, Lisa and Corinne, for your comments. Corinne, you are so right - Darlene Love really does resemble Tina Turner in that video clip! If you see the movie, I hope you enjoy it as well! I really want to see this documentary. I know we won't get it at our library branch so I may start keeping an eye on our neighboring systems. Bob, you would love this movie, so I hope you can find it. I thought of you when I saw it. It would make a great double feature with Standing in the Shadows of Motown!